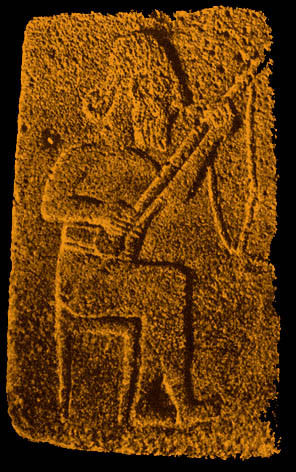 Paul: The next stringed instrument with fingerboard is from two Hittite sculptures (circa 1500 BC). 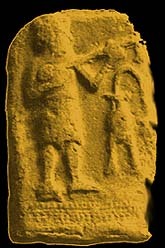 The first was found at Sendschirli in North Syria by German archeologists. When Sendschirli was at its peak it was a "Royal" Residence. The stringed instrument has a strap and rests on the players knee. The "bearded" player is shown with eyes fixed on the playing fingers of the left hand. 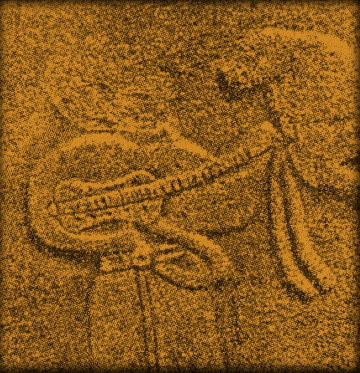 The second Hittite stringed instrument with fretboard is appearing in a sculpture on the castle ruins of Bos-ojuk in the northern part of Asia Minor. Very interesting details present themselves for the first time in history - the sides obviously INCURVE so as to bear a striking resemblance to the MODERN GUITAR! Several sound holes are visible. Absolutely, The most striking aspect of this instrument to me is the appearance of FRETS IN A GRADED SCALE DOWN THE FRETBOARD in a regular series !!! 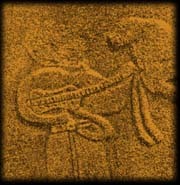 It also appears that two strings are attached to the "head" and a "plectrum" is attachad by a ribbon. Paul: Here is a LONGED NECKED LUTE type instrument shown on a terre-cotta plaque from Babylon, and dates from the early SECOND MILLENIUM BC! (circa 1250 b.c.) The instrument has an acute angle at the head, hence the "lute type" description. The player is wearing a kilt. I will dare to speculate that the "object" in the background is a "STILL" so you can speculate what he is singing about.